Craftin' Caro: September's Club projects! 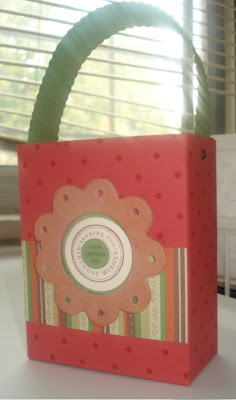 Next are the little boxes using a chipboard centre, the "Circle of Friendship" set, the new "Apple Cider" designer paper from the Holiday mini catalogue, plus a Wild Wasabi crimped handle (held in place with Vintage brads). 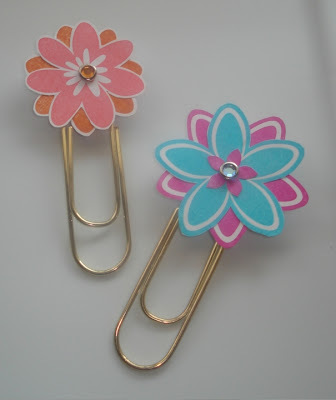 Last but not least are the jumbo clip bookmarks, or you can even add magnets to the back so you can stick your noteholder up on the fridge (to keep hold of coupons, etc). Everyone has a choice to make theirs from either "Bodacious Bouquet" or else "Office Accoutrements" and we added a fun Rhinestone brad to the centre, just for a little bling. Those "Canadians, INK!" gals on my team might recognize these as similar to the ones we made at our recent Quarterly Demo Stamp Camp. Club meetings are tons of fun, and a great way to get out monthly to do some stamping and play with new techniques and accessories! If you’re reading this and you live in Toronto, ON or surrounding areas (Mississauga, Scarborough, Etobicoke, Markham, Richmond Hill, etc.) and want to see what Stampers Club is all about, give me a call or visit my Club Info page. First-time guests are always FREE! Great projects Caroline! I especially love the get well card. What a cute face! I really like the first card. Very creative. 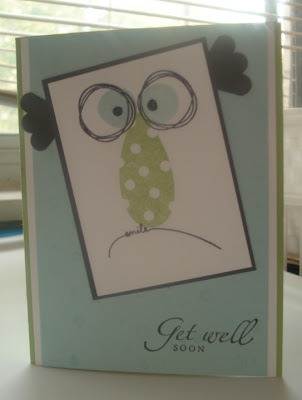 That Get Well card is "stinkin' cute"!! Thanks so much for sharing - I can't wait to make it myself. Great crafting! I love the get well card, its so cute, and the clips are adorable! I LOVE that pick a petal card! It is so clever!